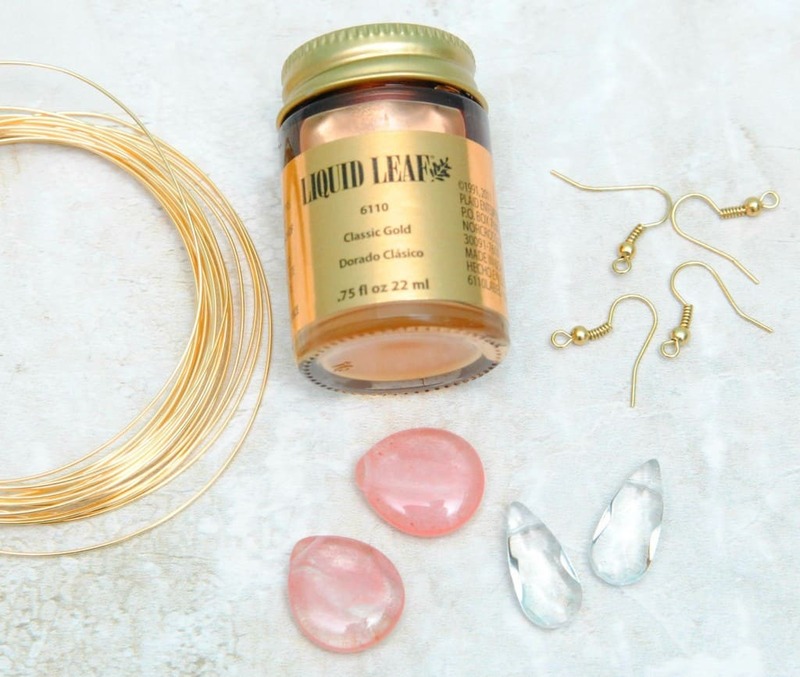 DIY Gold Dipped Teardrop Earrings because everything looks better dipped in gold. I’ve been wanting to make a pair of wire wrapped earrings for awhile now and I finally did it! It was so much easier than I thought it would be. And to add a little glam, I dipped the teardrop beads in gold leafing. I was so nervous about this entire project but I’m so glad I went with it because the gold dipped earrings turned out even better than I thought they would. Step 1: Cut your wire and wrap around the top of the teardrop bead. I used this great tutorial by Contrariwise Ramblings. Step 2: Add your earring hooks so you can hang them after you dip the ends in the gold leafing. Step 3: Dip the ends of the beads into the gold leafing paint. Let dry and then dip again. I had to dip the pink beads a third time to get a good coating but the clear beads only needed to be dipped twice. Step 4: Let paint dry and you are ready to wear your gorgeous new gold dipped earrings. I LOVE the way these earrings turned out! I can’t wait to stock up on more beads that I can dip in the gold leafing paint. I’ve teamed up with 14 super talented ladies to share more “golden” inspired projects with you today. I want a pair!!! So pretty!!! Pinning! These are gorgeous!! 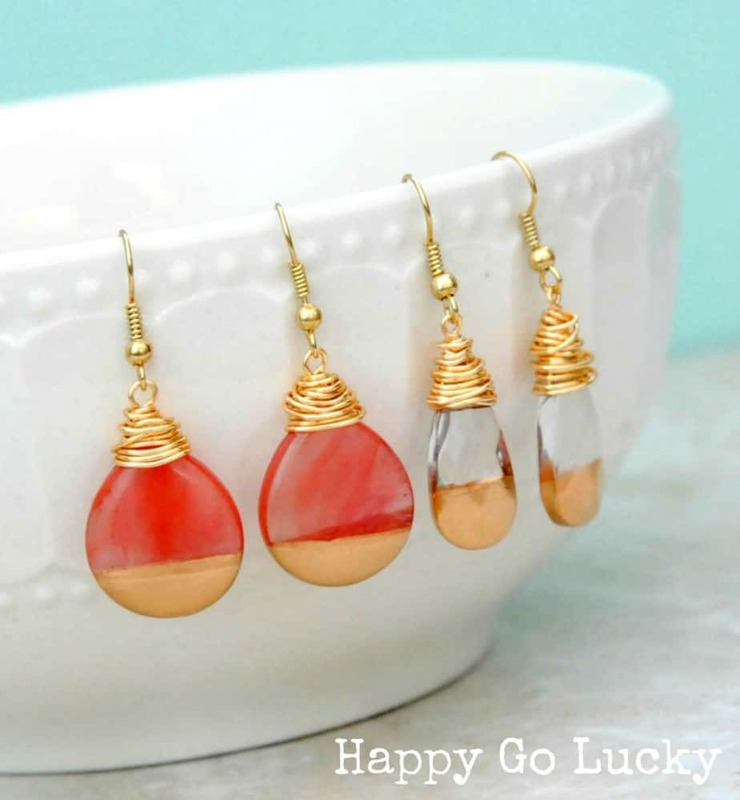 I want a pair too…I’m loving the gold wire wrapping around the tops – so pretty!! These look so pretty! Isn’t liquid gild the best! 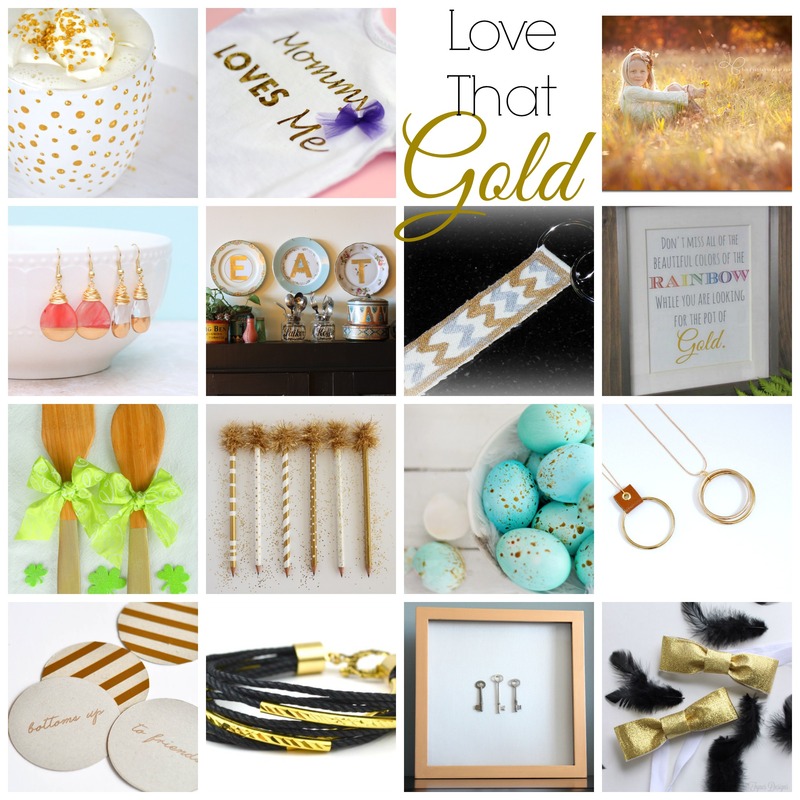 Shauna recently posted…Vintage Key Art + Pot of Gold Giveaway! I love these! So pretty and so simple. I will have to get my gold on ASAP. Kara – I’ve never used gold leafing paint! Where have I been? 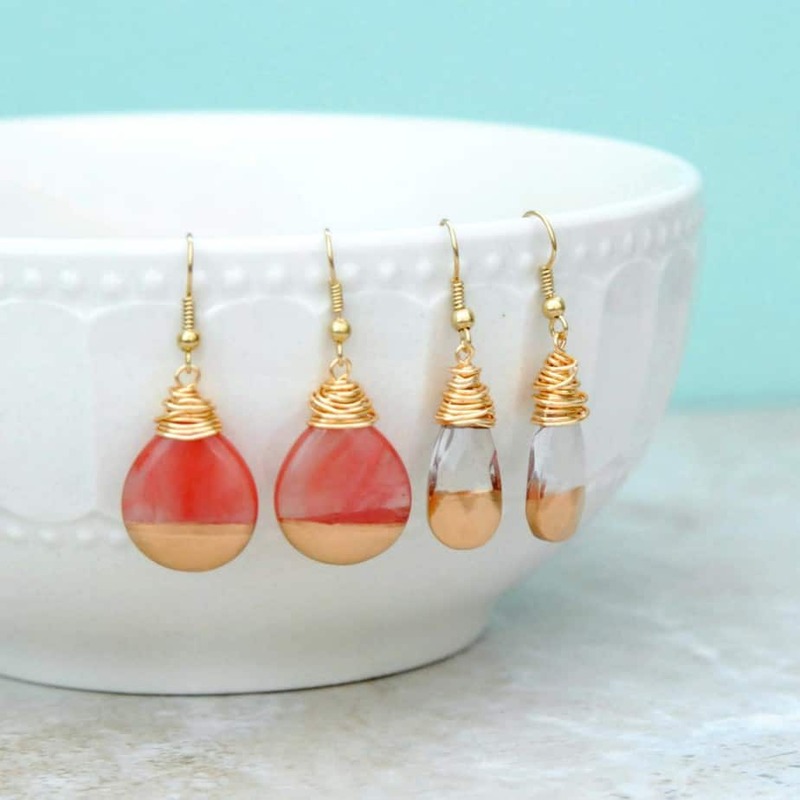 I love these earrings – they’re divine! Pinning! 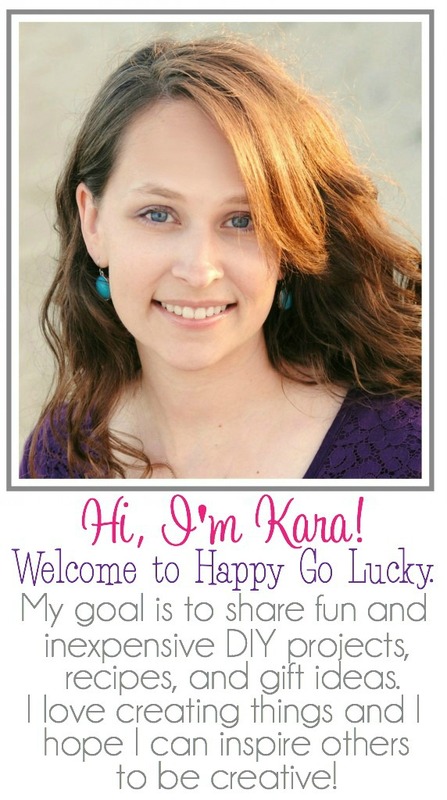 Tara recently posted…Kate Spade-inspired Coasters (with a free cut file!) and a $300 GIVEAWAY! Kara, the addition of gold leaf really makes these earrings stand out! These are GORGEOUS! Marilyn recently posted…Gro-ables from Miracle-Gro Turn Black Thumbs Green! Kara these are gorgeous! I don’t have liquid gold leaf but I’m SO about to – I totally love this idea. I’ve seen the gold-dipped look on other projects but this is the first time I’ve seen it on jewelry. It’s perfect. Oh so pretty, I love these. The gold is beautiful. These are so beautiful! You did an amazing job! These are so pretty Kara! I’ll have to try some of that gold liquid leaf. Thanks so much for sharing! I don’t have liquid gold leaf but I’m SO about to – I totally love this idea. I’ve seen the gold-dipped look on other projects but this is the first time I’ve seen it on jewelry. It’s perfect.